Robert H. Wells, 80, went home to be with Jesus Christ his Savior, and surrounded by his loving family. He was born on December 15, 1938 to Paul and Bernice Wells. A graduate of Nottingham High School and Hamilton College, he completed his Master’s Degree in Journalism at SU. Bob served as Military Police in the US Army from 1961-1963 at Fort Gordon, GA, and was in the reserves until 1965. He retired from Niagara Mohawk after 29 years as Manager of Public Affairs and Communications. 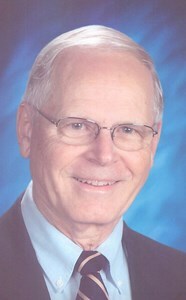 He was President of PRSA in 1979, President of the Fayetteville Library and of Literacy Volunteers. He became part of The Living Word Church family after his life changing trip to Israel, where he received the Lord as his Savior by the Sea of Galilee. He was in the choir, taught clarinet at LWA, and played in the Saints Dixie Land Band. He enjoyed golfing, gardening, bird watching and vacationing with his family. Bob was a loving family man. He is survived by his wife of 56 years, Sally; daughters: Kathryn (Mick Giroux), Deborah (Michael Cerelli) and Jennifer (Daniel Plewak); Grandchildren: Victoria, Samuel, Jericho, Timothy, Grace, Jeremiah, Isaac, Stephen, Autumn and Joshua. Great-grandchild: William. Calling hours will be at Living Word Church, 6101 Court St. Rd., Syracuse on February 9th from 10am-12pm, with a funeral service at noon. Add your memories to the guest book of Robert Wells. Dear Wells Family, We are sorry that we are away and that we could not attend the wake and funeral service for our beloved Brother Bob. Our hearts go out to your entire family at this very challenging time. To us, Bro. Wells was a wonderful brother and a true gentleman. It has always been our privilege to know him. What a wonderful example you all have had in your lives. I will personally miss greeting him at the eastern entrance to our church every Sunday morning but he will be the one greeting us at the Eastern Gate when we too depart this sojourn of life in another moment. May the God of all comfort and grace be with you all at this time. We interacted with Brother Bob at Niagara Mohawk, church, camp, and the Dixie Land Band, and always found him to be a kind, gentle and helpful man who we will miss. I remember that his nickname in the Dixie Land Band was "second wind Bob", for he took up the clarinet a second time so he could play in the band and teach lessons, and he did a great job at it. He was a good Christian example and his 56 year marriage and God fearing family speaks volumes. Our condolences to the Wells Family. He is now amongst the angels watching down on us. His love will remain with us. Our prayers are with you. Rest In Peace Mr. Wells. We are saddened to hear about Bob’s passing. We pray that the Lord comforts you, Sally, and your entire family, but we know that this earth’s loss is heaven’s gain. He is rejoicing in Heaven with our Lord and Savior! Sending hugs and prays to all of you. We would like to extend our deepest sympathies to Sis. Sally, the Girouxs, the Cerellis, and the Plewaks at this time. Bro. Bob was a very special man and will certainly be missed. Anna really took to Bro. Bob and we are glad she was able to see him one last time before he passed. He really made an impact in her life. Praying that the Lord will comfort your hearts at this time and give you peace knowing that Bro. Bob made it home into the arms of the Lord. Though our hearts are heavy, we raise up our hands and praise the Lord for our Brother Bob has completed the race and claimed his heavenly reward. Bro. Bob's salvation on our Israel trip was so special. Praying God surrounds the family with His presence, grace and compassion. He will be missed by all the Living Word family. We wanted to extend our deepest sympathy and prayers for your family with much love in Christ, the Asiedu family.